Rompin', Stompin' Chomps is first level of World 5 in the game Yoshis Island DS. 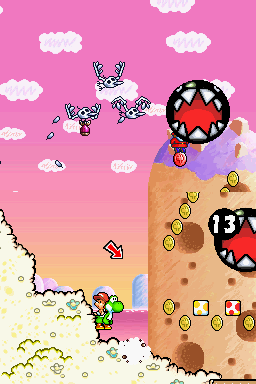 In this level, Yoshi has to avoid several Stompin' Chomps, which occasionally fall from the skies. The Chomps can be found bouncing on the ground as well. This level also features Incoming Chomps and a Chomp Shark. The level begins with Yoshi near an Egg Block and a Message Block near him. This level also autoscrolls. Nearby are several Stompin' Chomps, as well as a few Fleepers. After avoiding a few more enemies and Skeleton Goonies, the player lands on a terrain which crumbles when Stompin' Chomps land on it. After some more enemies, Yoshi comes to the next area. Here awaits a Stork Stop and a Middle Ring, followed by more enemies. Yoshi must ride some wind gusts and pass a few enemies to get to another Stork Stop. Yoshi needs to climb on some vines and avoid more Stompin' Chomps to access the next area. In here, after a Stork Stop, a Chomp Shark begins to chase Yoshi, until it breaks down. After a few more obstacles, Yoshi reaches the goal roulette. Wanwan dayo! Zen in shūgō! It's Chain Chomp! Everybody Meet Here! Meongmeong'i deungjang! Chain Chomp appears!